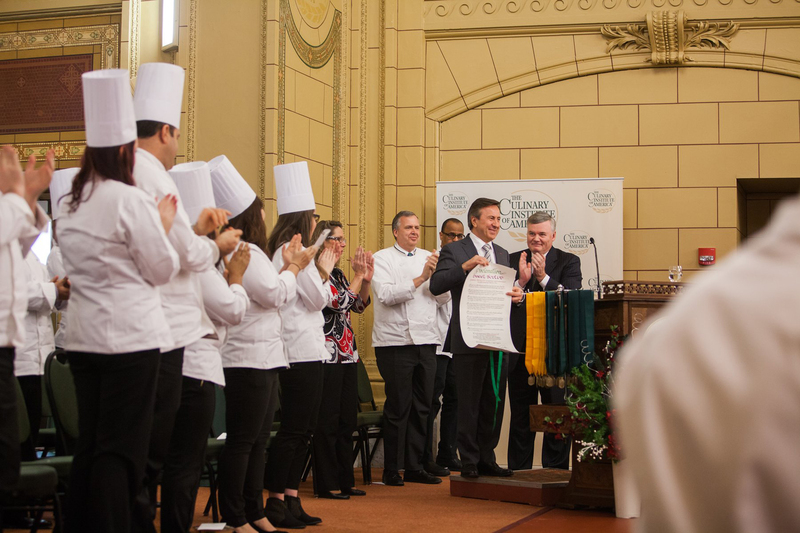 Hyde Park, NY – World-famous chef and restaurateur Daniel Boulud told graduates of The Culinary Institute of America (CIA) that to be successful in the restaurant world takes cooking skills—and a whole lot more. Chef Boulud was the commencement speaker at the college's Hyde Park, NY campus on Friday, December 20. 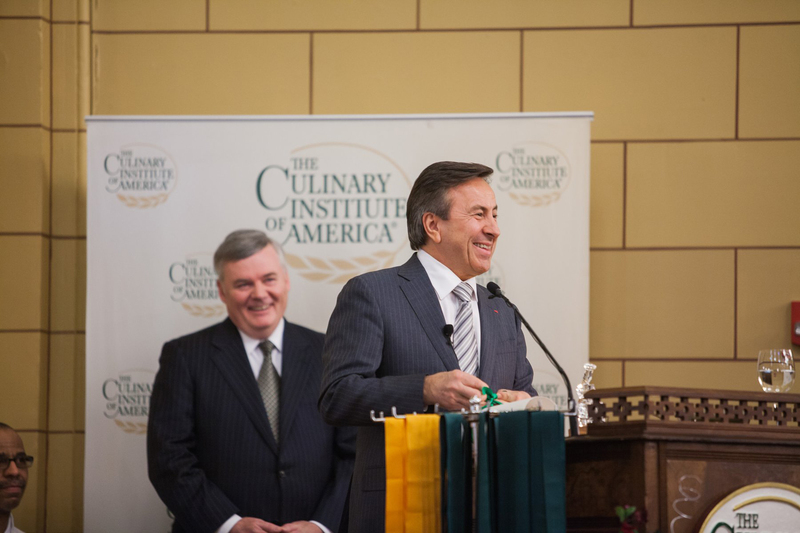 During the ceremony, CIA President Dr. Tim Ryan proclaimed Boulud an honorary alumnus of the college. "Your CIA degree is a valuable asset in the industry. You can be proud of the hard work, time, and effort you have put into your education," Boulud advised 47 recipients of associate degrees in culinary arts and baking and pastry arts. "You will soon be a chef. To be great at it, you also need to know what it takes to be a sommelier, accountant, contractor, nutritionist, designer, HR director, food safety expert, farmer, butcher, fisherman, and scientist. And sometimes even a therapist." A native of Lyon, France, Chef Boulud is currently based in New York City. His restaurant management company, The Dinex Group, consists of 13 highly respected and successful restaurants around the world. His eponymous flagship, DANIEL, is one of only seven New York City restaurants with a coveted three-star Michelin Guide rating and was included on this year's list of the World's 50 Best Restaurants. Chef Boulud started his culinary career as an apprentice in a two-Michelin-star restaurant at age 14. A year later, he was working for the legendary Paul Bocuse. "To become one of the best, you have to work with the best," he told graduates. As part of Boulud's longstanding philosophy to nurture culinary talent and build careers, DANIEL is one of seven Dinex restaurants where CIA students can complete their required externship field experience. In September, Chef Boulud was commencement speaker at the CIA's only international campus in Singapore, where he inspired 37 students earning their bachelor's degrees in culinary arts management. Founded in 1946, The Culinary Institute of America is an independent, not-for-profit college offering associate and bachelor's degrees with majors in culinary arts, baking and pastry arts, and culinary science, as well as certificate programs in culinary arts and wine and beverage studies. As the world's premier culinary college, the CIA provides thought leadership in the areas of health & wellness, sustainability, and world cuisines & cultures through research and conferences. The CIA has a network of 45,000 alumni that includes industry leaders such as Grant Achatz, Anthony Bourdain, Roy Choi, Cat Cora, Dan Coudreaut, Steve Ells, Charlie Palmer, and Roy Yamaguchi. The CIA also offers courses for professionals and enthusiasts, as well as consulting services in support of innovation for the foodservice and hospitality industry. The college has campuses in Hyde Park, NY; St. Helena, CA; San Antonio, TX; and Singapore.